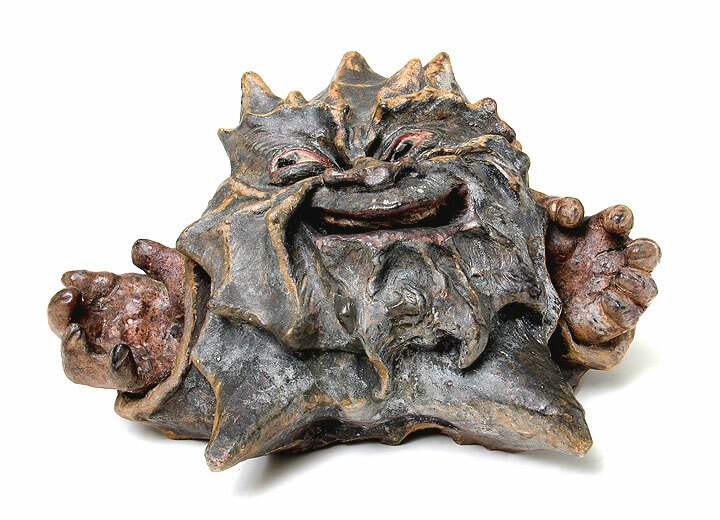 Very few people are neutral about Martin Brothers stoneware — they either love it or hate it. Those who love it put their money where their mouths are. More than a few people have put together multi-million dollar collections. One of the greatest collections ever assembled was by the California team of Harriman and Judd. They amassed some of the finest and rarest of all Martinware items, including a really great pair of birds depicting the 19th Century English politicians Disraeli and Gladstone. After Judd’s passing in 1999, the collection was sold at Sotheby’s New York over the course of a couple of years, as the collection was too vast to sell in one sale. Prices were strong at the sales until the October, 2001 sale, shortly after the 9/11 attacks. Since then, the market has done very well, with prices doubling, tripling and quadrupling for the best items. As expected, items in perfect condition bring a premium over those with restoration. However, restored items can still be valuable, depending on the item and the amount of restoration. Tobacco jars in the forms of birds, with removable heads, are the most collectible, but spoon warmers, vases and many other items are also highly desirable. 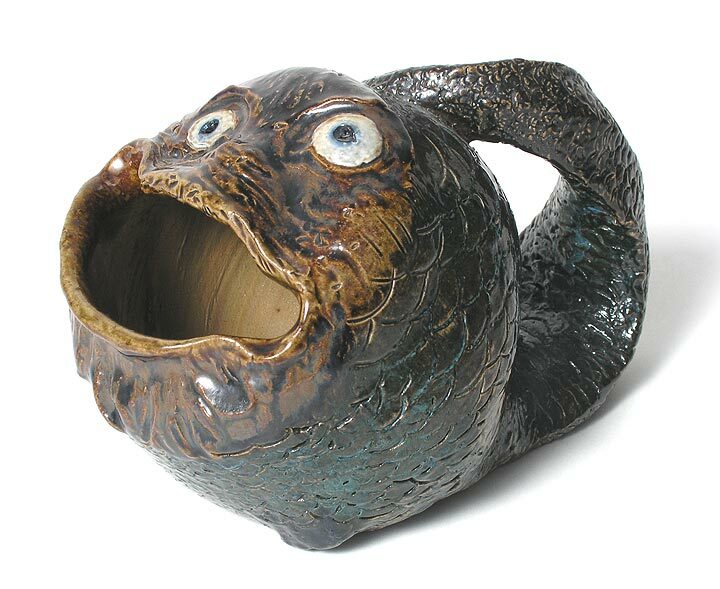 The more “grotesque” the item, the better. I’ve got several collectors who are looking to add to their collections, so I’m buying. Do you have anything for sale? Please send a photo to philchasen@gmail.com. I’ll get back to you promptly and let you know if I’m interested. My goal is to publish new posts twice a week — Mondays and Thursdays. However, if you don’t see a new post on Thursday, it’s because I was too busy, so please look for a new one the following Monday. 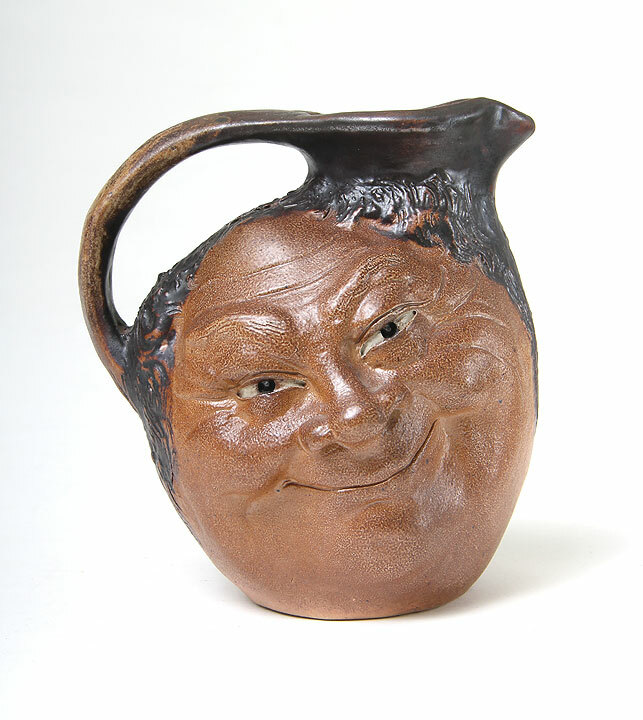 This Thursday’s blog will be about the booming market in Martin Brothers stoneware. 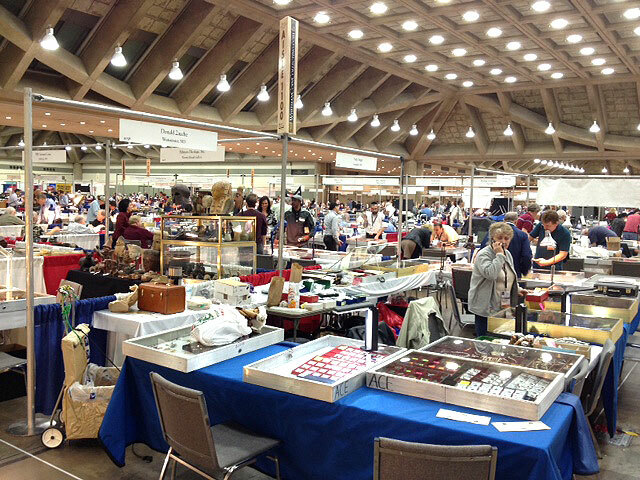 The Whitman Coin and Collectibles Expo was held at the Baltimore Convention Center, March 22-24, 2012, but many dealers left on the 24th, as we did. It’s was a coin show, but dealers were allowed to bring additional items, under the category of “collectibles”. We exhibited there because some of the coin dealers are our clients. The view of the show floor from my booth. It’s not the first time we’ve exhibited at a coin show. The others were modestly profitable, so we thought we would give this one a try. Unfortunately it was a complete bust. 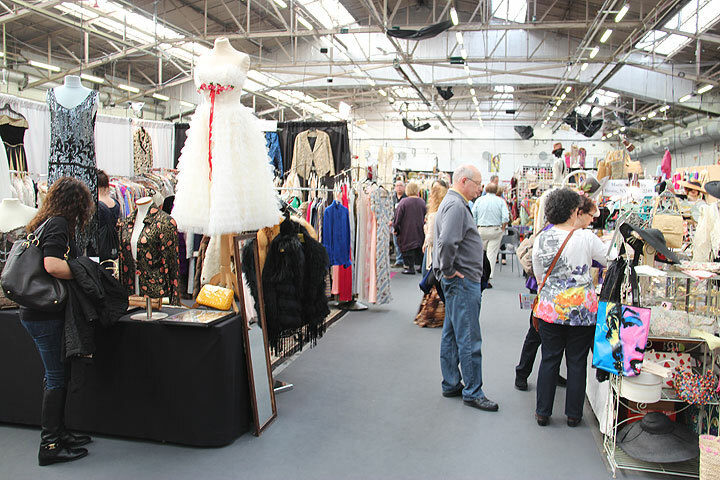 There was interest from some of the dealers and also the public, but almost no sales. Two of the main coin dealers I hoped would buy from us never even attended the show. We wound up making one tiny sale on the last day, but we would have been much better off never coming. I think we’ll stick to traditional antique shows from now on. Speaking of which, our next show will be at the Arlington Park Racetrack, in Arlington Heights, IL, April 13th to April 15th. I’ll be bringing some of the best Tiffany Studios table lamps I’ve had in years. In addition, I’ll have a great selection of French cameo glass, a small collection of Martin Brothers ceramics, fabulous American Illustrator paintings, a number of Icart etchings that I just acquired, and assorted wonderful odds and ends. Don’t miss the show. There’ll be something for everyone. Stella Show Management held their semi-annual NYC Pier Antiques Show this past weekend, March 17-18, 2012, with generally excellent results. Attendance was excellent on opening day, Saturday. Interest was heavy and sales commensurate. My booth was the busiest it’s been at any show I can think of in the last 10 years. At one point in the morning, there were six bona fide buyers in my booth, all wanting my attention at the same time. My friend Tony and I could not handle the questions fast enough. I didn’t even realize I hadn’t eaten lunch until about 3:15 PM, when there was a break of five minutes. It was a good day by the time it ended at 6 PM, but I was frazzled and needed a drink. Where was I before my rant? Oh, Sunday. Attendance was lighter on Sunday, but still pretty decent. The pace of the day was much more manageable and sales continued for me. How’s this comparison? 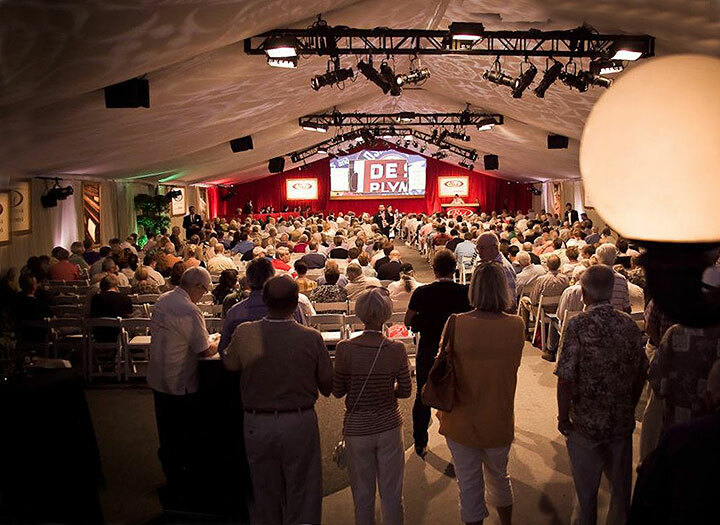 The Original Miami Beach Antiques Show in February was a good show. It had a two-day setup and five-day public opening. For significantly lower expenses and a much smaller time commitment, I did 85% of the business at the Pier show that I did at the Miami Beach show. That’s quite an accomplishment. For me, it was the best show I’ve had at the Pier in many years. (And that was with two of my best NYC clients not buying anything from me.) 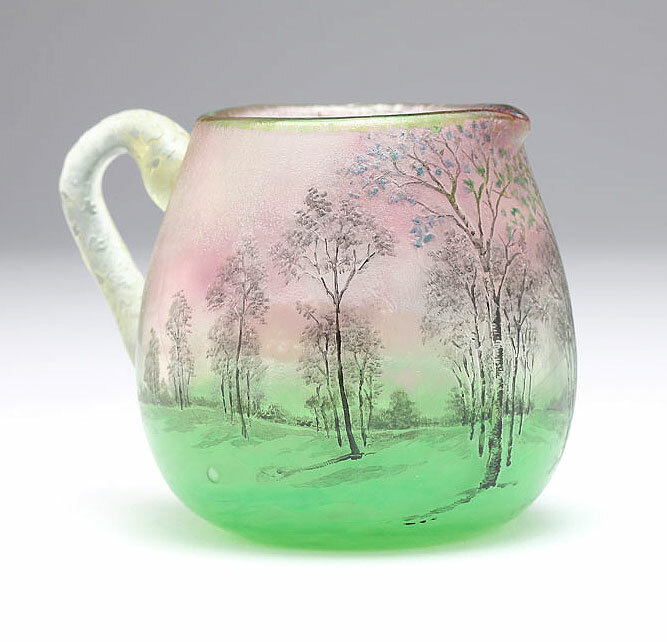 Sales were diverse, from Tiffany glass and a lamp and an inkwell, to French cameo glass, to Icart etchings. In asking around to many dealers, I got the following responses. A dealer in Art Deco furnishings, jewelry and furniture, told me she had the best Pier show in many years. (Sound familiar?) 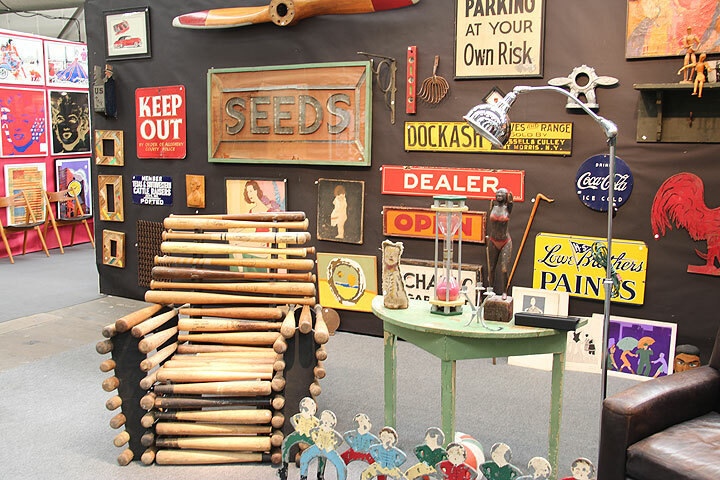 A dealer in furniture and bronze exhibited at the Pier show for the first time. Many, many items in his booth were marked sold, and this was after a fabulous show in Miami Beach. He told the show promoter, Irene Stella, that he’s looking forward to the next Pier show. 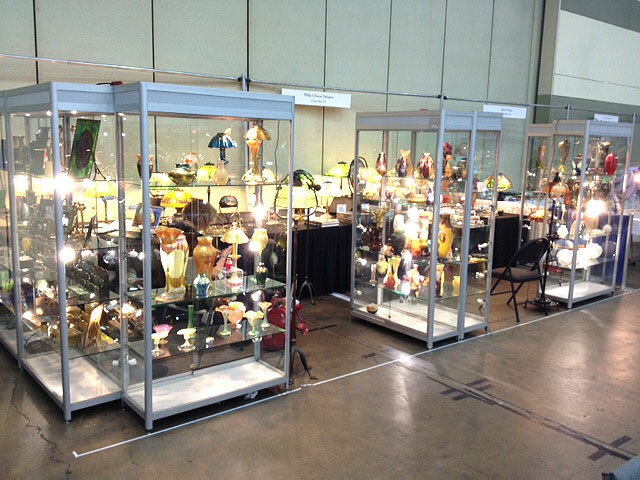 A couple of dealers in art glass said they had decent, but not exceptional, shows. A dealer in lamps said his show was good with sales of both lamps and glass. Two other glass dealers told me they had good shows. Most responses were favorable. But no one show has all winners. One new dealer in lamps told me his total sales were zero (ouch!). Another dealer told me that most of the dealers he had spoken to had poor shows. Who did he speak to? They definitely weren’t the ones I spoke to. If I add up all of the anecdotal information I’ve been gathering at antique shows, auctions, and general scuttlebutt, the market in antiques is really heating up. For example, my friend, Jim Julia, just had a gun and knife auction last week. He’s had some great sales, averaging about $10 million. His best gun sale to date grossed $12 million. Last week’s sale hit $18 million. According to Dudley Browne, the lamp and glass coordinator, people were throwing money at some of the items. Bidding was wild and wooly. It just warms the cockles of my heart. 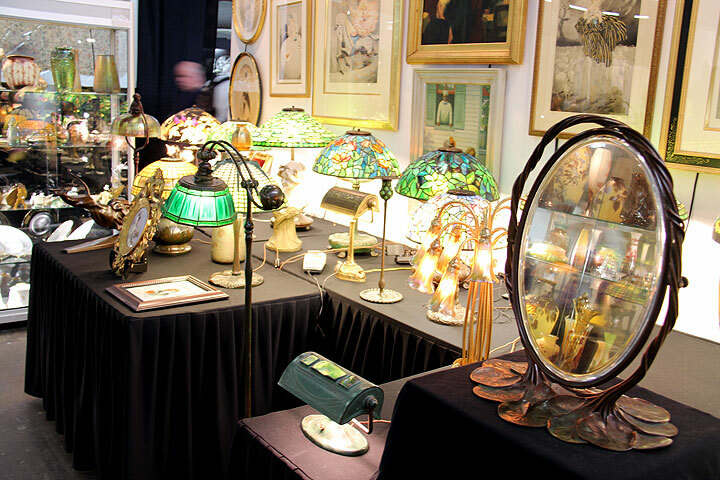 The next NYC Pier Antiques Show is scheduled for November 17-18, 2012. If I were you, I’d starting making my plans now. You won’t want to miss it. Our next show is the The Whitman Coin & Collectibles Expo, at the Baltimore Convention Center this coming week, March 22-24. It’s an experiment that I hope will work. I’ll be the only antiques exhibitor at the show. If the dealers and the public are in a good mood, I may wind up making some sales. Keep your fingers crossed. I’ll keep you posted. My goal is to publish new posts twice a week — Mondays and Thursdays. However, if you don’t see a new post on Thursday, it’s because I was too busy, so please look for a new one the following Monday. 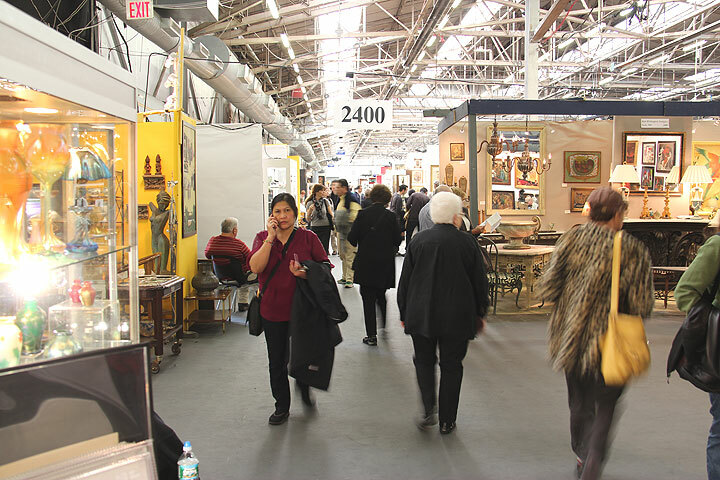 Monday’s blog will be about the results of the NYC Pier Antiques Show. You won’t want to miss that. 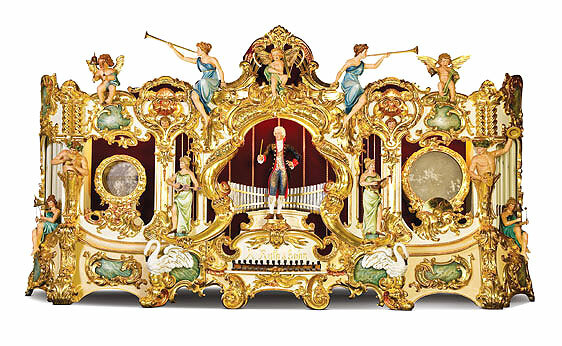 Christie’s New York held their 20th Century Decorative Art & Design sale on March 8, 2012. There was a relatively small, but sophisticated, selection of French cameo glass for sale, as well as a few Tiffany lamps. The high quality French cameo glass sold very well, with several impressive results. Daum blackbird vases are rare and very desirable. Lot #3 was a special example, with excellent detail, yellow in the background, an attractive shape, and good size at 11″. Conservatively estimated to sell for $6,000 – $8,000, it quadrupled its high estimate to sell for $40,000, including buyer’s premium. 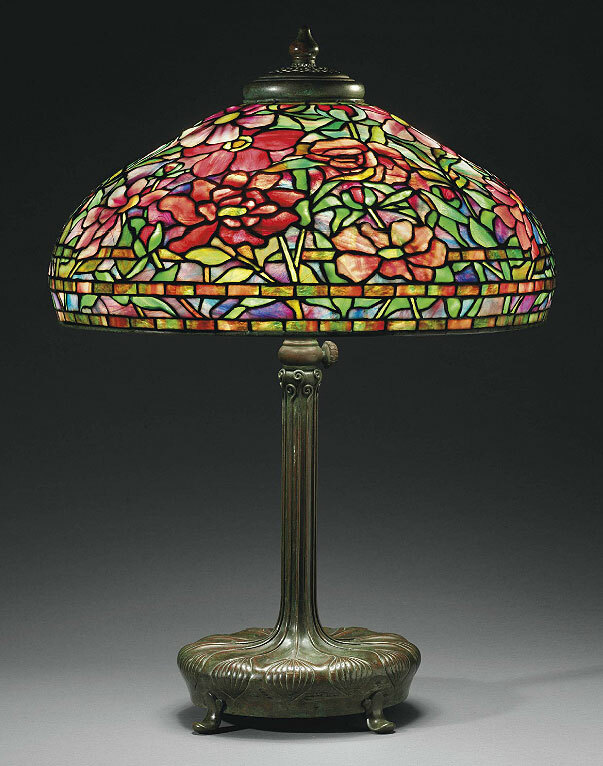 There was a small selection of Tiffany Studios lamps offered, with one selling for a bargain. 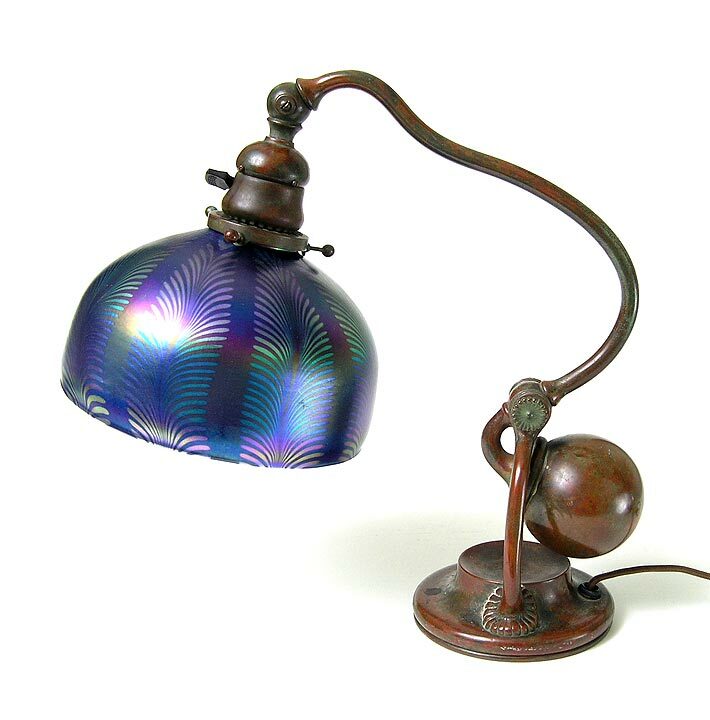 Lot #43 was a full-size Tiffany Studios 22″ Peony table lamp. 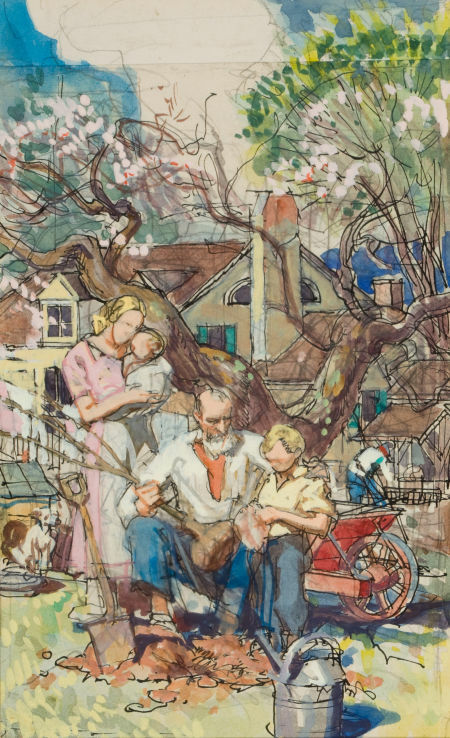 Estimated to sell for $80,000 – $120,000, it sold for only $74,000 at the hammer ($92,500 including the buyer’s premium). Kudos to the buyer for scooping it up. For the complete results of the auction, click on the following link. Christie’s 20th Century results. Our next show is the New York City Pier Show at Pier 94, the Hudson River and 54th St., in New York City, this coming weekend, March 17th and 18th. It’s always fun, so make sure you come to the Big Apple and visit our show! You’ll be happy you did. My goal is to publish new posts twice a week — Mondays and Thursdays. However, if you don’t see a new post on Thursday, it’s because I was too busy, so please look for a new one the following Monday. 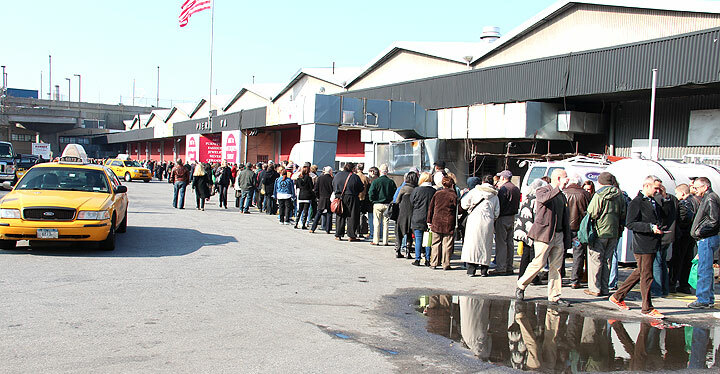 This Thursday’s blog will be about the results of Christie’s New York 20th Century Design sale on March 8, 2012. 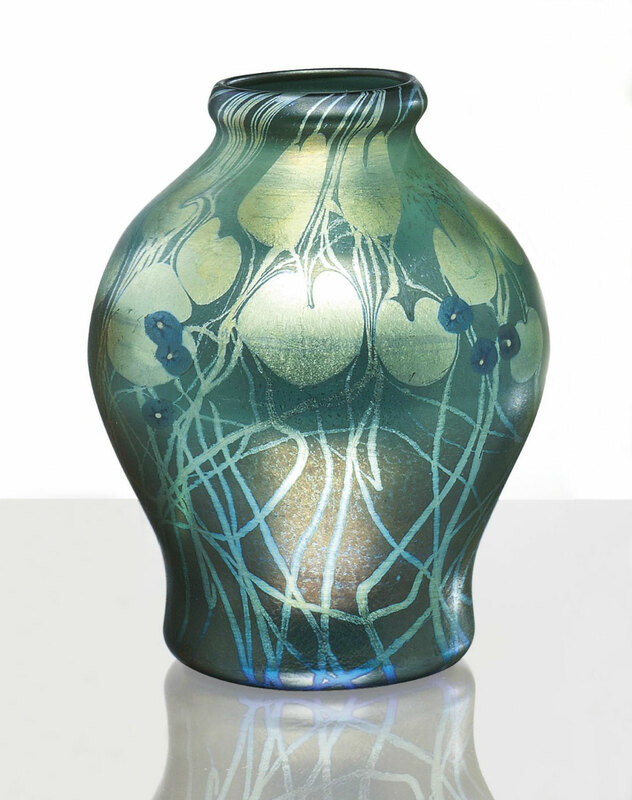 Sotheby’s New York held a 20th Century Design sale on March 7, 2012. It was a mid-level sale, as the major auction houses save their best items for December and June. 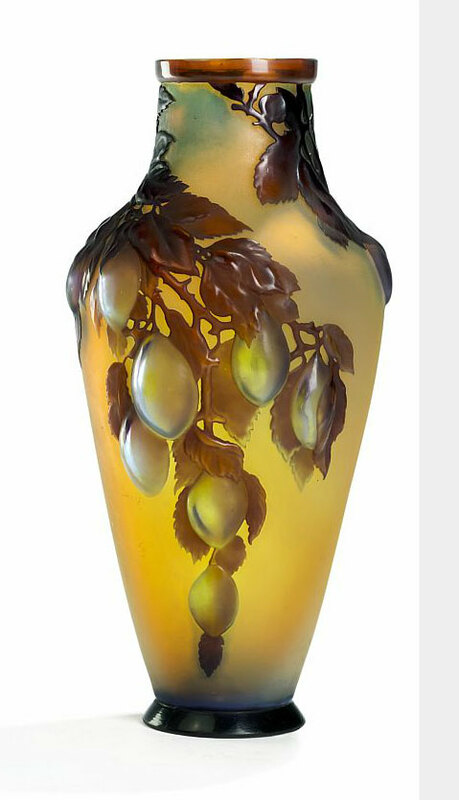 The selection of French cameo glass was small, but high quality, while the selection of Tiffany lamps was not strong. There still were some very good results. 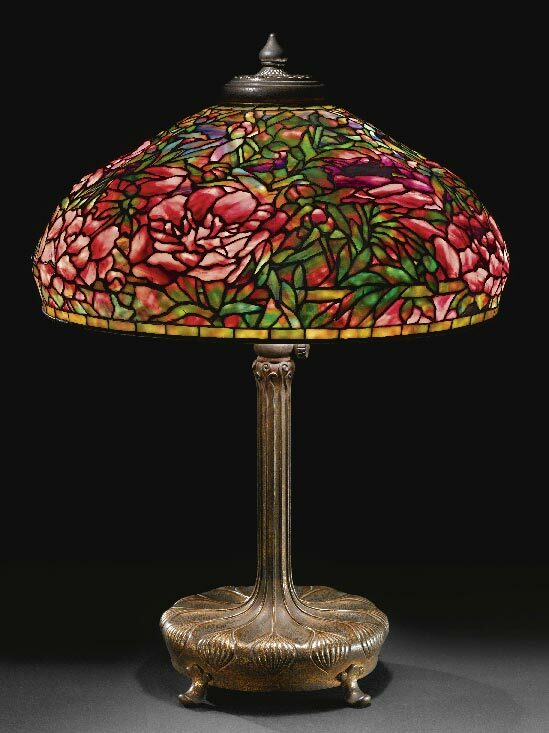 Top lot of the sale was #243, a Tiffany Elaborate Peony table lamp. It sold for $242,500, against a pre-sale estimate of $150,000 – $200,000. There were problems with the lamp that depressed the price. First, it had quite a bit of damage to the shade. Second, the shade finish was gold on a worn gold doré base. 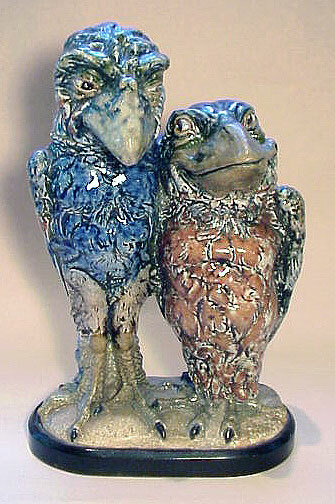 Had it been a patinated shade and base, with little or no damage, it probably would have sold for double or more. Even as is, I thought the final price would be higher, as the shade was rare and beautiful. Other French cameo vases were equally strong, with a Decorchement pâte-de-verre vase with beetles selling for $50,000, against a pre-sale estimate of $8,000 – $12,000 and a Gallé vase selling for $31,250, against a pre-sale estimate of $12,000 – $18,000. 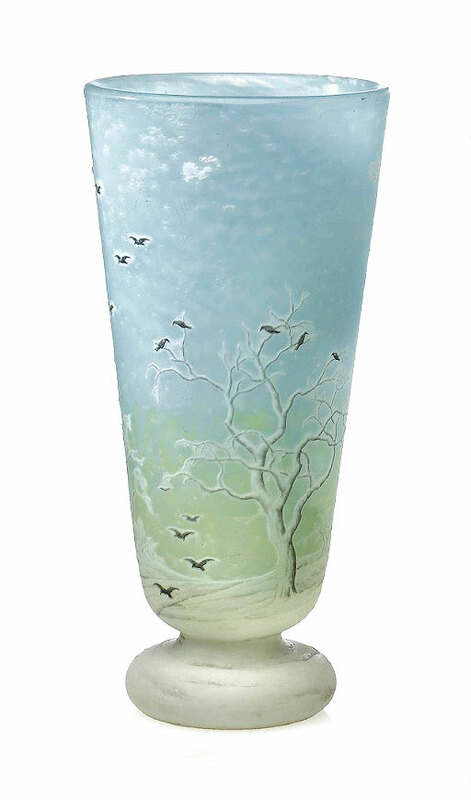 This continues a string of strong auction results for superior French glass. 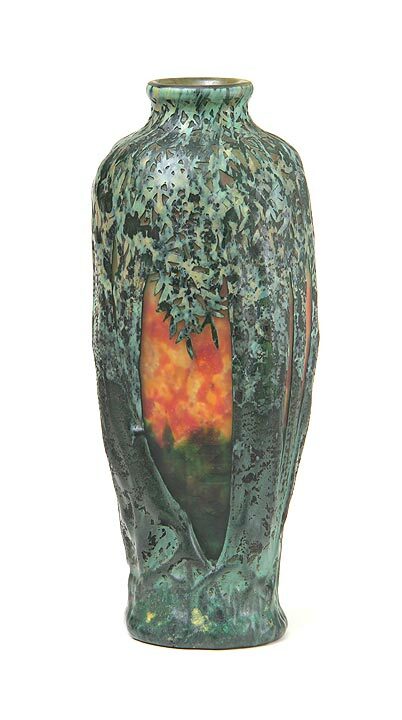 Camille Fauré enamel on copper vases have been strong for a couple of years, but not at this auction. All four lots were passed, partly because the estimates were too aggressive. For the complete results of the auction, click on the following link. Sotheby’s 20th Century results. Our next show is the Pier Show at Pier 94, the Hudson River and 54th St., in New York City, this coming weekend, March 17th and 18th. It’s always fun, so make sure you come to the Big Apple and visit our show! You’ll be happy you did. In the meantime, we’re still in business, so don’t be bashful. Call or write! John Moran held an Antiques & Decorative Arts Auction at the Pasadena Convention Center in Pasadena, California on March 6, 2012. 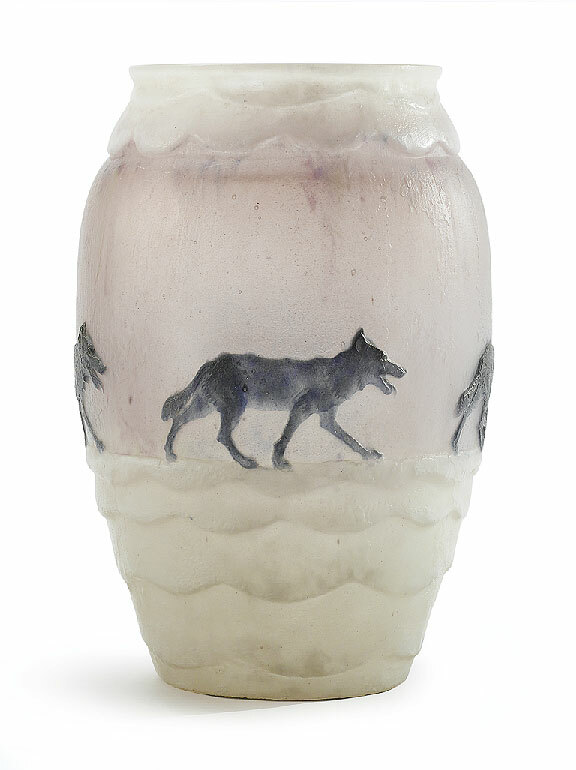 Included in the sale were a few outstanding lots of French cameo glass. 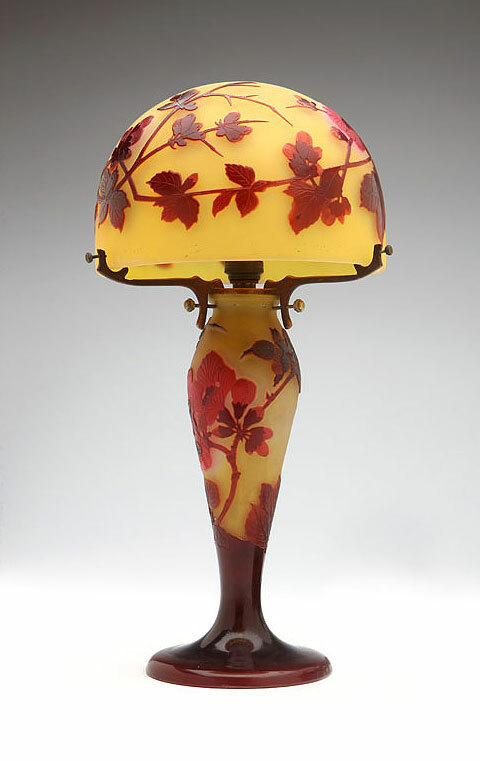 Lot 1058 was a medium-sized Gallé lamp with red prunus blossoms on a yellow background, 14″ tall. The color, quality and condition were all excellent. Expected to sell for only $2,000 – $3,000, it roared past the estimate to sell for $13,100, including buyer’s premium. The estimate was very low, letting everyone know the lamp was there to be sold. Smart auctioneers put low estimates because they generate better interest and results. 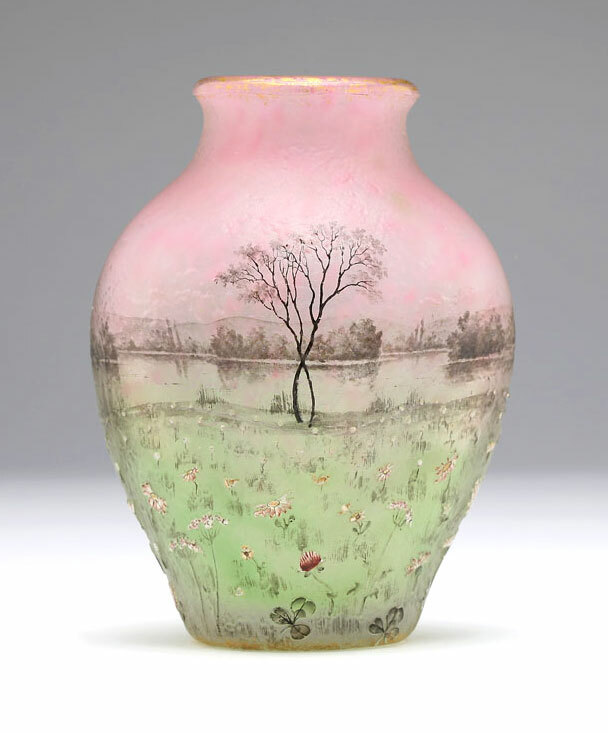 The next lot was a very rare and desirable Daum Nancy vase with Prairie decoration. 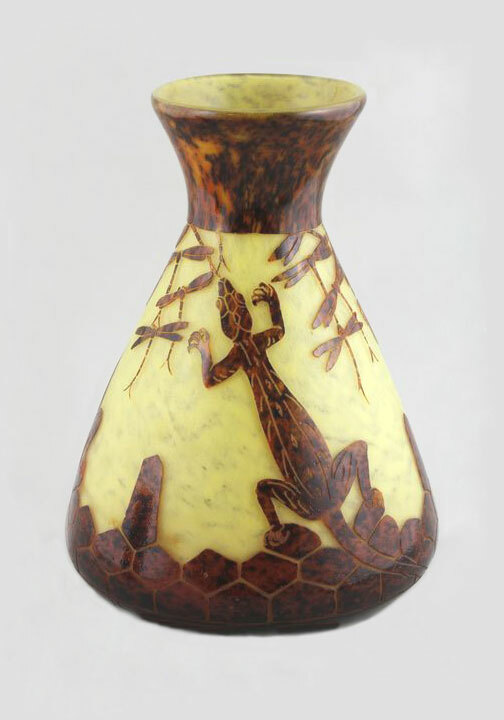 Prairie vases are beautiful and very difficult to find. 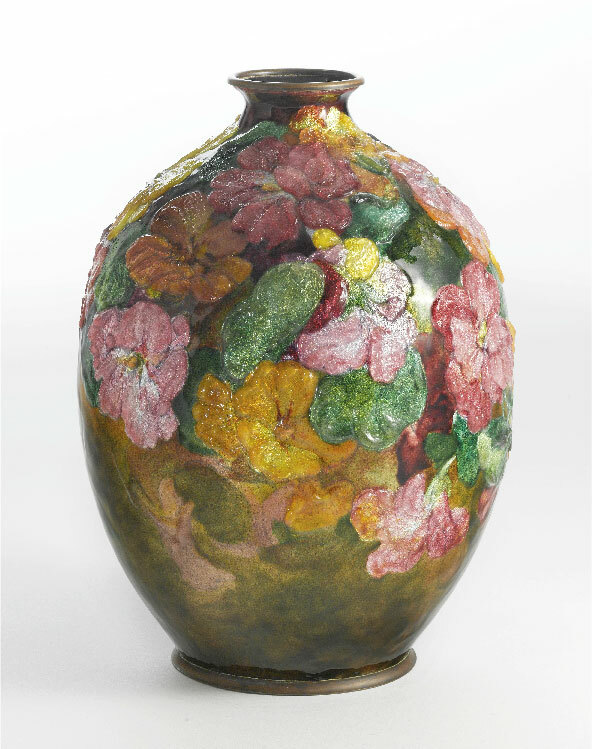 This example had excellent color and workmanship, but was a little small at 4¾”. Also for some inexplicable reason, it was unsigned. Daum signed almost everything, so it’s hard to explain why this one was unsigned. With a realistic pre-sale estimate of $5,000 – $7,000, it sold for $12,000, including buyer’s premium — double the low estimate. I was interested in purchasing it, but couldn’t pay more without a signature. My guess is that it probably would have sold for over $15,000 if it had been signed. For the complete listing of the auction, click on the following link. John Moran auction listings. My guess is they’ll have the results listed in a few days. Our next show is coming very soon — the Pier Show in New York City on the weekend of March 17th and 18th. You don’t have a lot of time, so plan your trip now. Make it a business/pleasure trip and have a great time in the Big Apple! My goal is to publish new posts twice a week — Mondays and Thursdays. However, if you don’t see a new post on Thursday, it’s because I was too busy, so please look for a new one the following Monday. Thursday’s post will be about some very good French cameo glass sales at a recent auction. Heritage Auctions held a successful auction of Illustration Art in Beverly Hills, CA, on March 1st and 2nd, 2012. Total sales exceeded $3,000,000, with a sell-through rate of 98%. Top lot of the sale was #78117, an oil on canvas illustration by Gil Elvgren, entitled Vision of Beauty (Unveiling), from 1947. It sold for $140,500, against a pre-sale estimate of $50,000 – $75,000 — almost double the high estimate. Fourteen works by Elvgren were offered, with eleven of them pin-up paintings. Six of those sold for over $50,000, raising the average selling price for Elvgren to $55,915 — far and away the best for any artist in the sale. The highest price paid for a non-Elvgren painting was $62,500, for a 1937 oil on canvas cover illustration for Spicy Adventure Stories by Hugh Joseph Ward. The selling price was almost double the high estimate of $35,000. 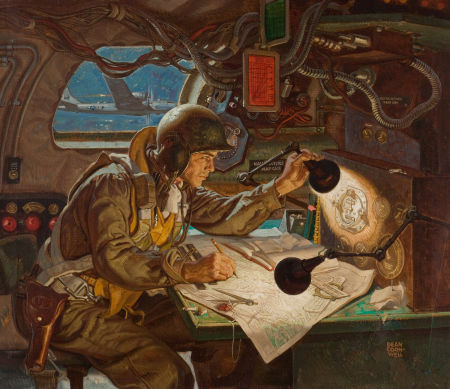 A Body by Fisher/General Motors oil on canvas advertisement by Dean Cornwell, from 1945, entitled On Target- Let’s Finish the Job, did very well. It quadrupled its high estimate of $9,000 to sell for $37,500. At the other end of the sale, prices started as low as $28 for a portrait of Mrs. Brunner, circa 1950, by Frederick Sands Brunner. In fact, there were 48 items that sold for $100 or less. You could even buy an original work by an important artist like Dean Cornwell, Raleigh Receiving the Charter, for $687.50. Granted it was small — 10½” x 6½”, a pen and watercolor on paper study, and unsigned, but it was still a bargain. For the complete results of the auction, click on the following link. Heritage Illustration auction results. RM Auctions, in association with Sotheby’s, held an auction of the Milhous Collection of musical instruments, cars and collectibles, at the Milhous Museum in Boca Raton, Florida on February 24th and 25th, 2012. The auction was strong, with individual eye-popping results. Total sales were $38.3 million with 100% of the items selling – a superb result. The museum was not open to the public, but I had the privilege of visiting about 15 years ago, when I sold five Louis Icart etchings to Paul Milhous. Wow, what a museum — filled with classic antique automobiles and the most amazing selection of meticulously restored orchestrions, assembled from all over the world. The music was fantastic, just like the best merry-go-round you’ve ever been on. Louis Icart etchings were a tiny part of the auction, but since I sold them to him, I’m mentioning them first. I’m happy to report they all did great! When was the last time you heard of superb prices for Louis Icart etchings at auction? It’s been a while. I hope this is the start of a new leg up in the market. Lot #364 was Leda and the Swan. It sold for a whopping $21,850, against a pre-sale estimate of $5,000-$7,000. Other great Icart results were Lilies, $9,200; Orchids, $9,200; Speed II, $7,475; and Waltz Echoes, $8,625. If you would like to purchase any of the same etchings, framed in the same 24K gold leaf frames, for a fraction of the price, please contact me. 516-922-2090 or philchasen@gmail.com. 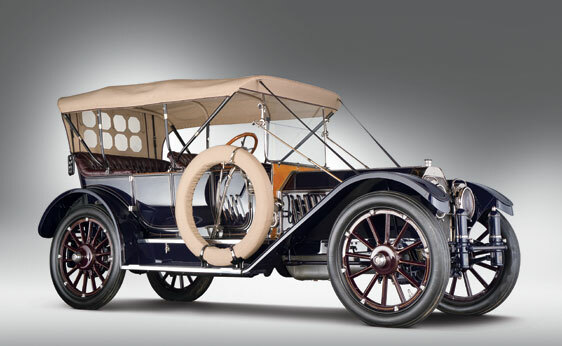 Top lot of the auction was a 1912 Limited Five-Passenger Touring Oldsmobile, sold as lot #823. It doubled its pre-sale estimate of $1,400,000-$1,600,000, to sell for $3,300,000. The top orchestrion in the sale was lot #784, a 1903 Ruth Style 38-B Fair Organ by A. Ruth & Söhne from Waldkirch, Germany. It sold for $1,265,000, within the pre-sale estimate of $1,000,000-$1,200,000. On a personal note, I tried buying one of the player pianos, but prices were too strong for me. Drats! For the complete results of this extraordinary auction, click on the following link. The Milhous Collection results. Our next show is the Pier Show in New York City on the weekend of March 17th and 18th. It’s always fun, so start planning your trip to the Big Apple!